What can I do with my AU One Card? From dining to entertainment, your One Card provides a wide range of features. Eating on and off campus is easy when you have a meal plan, EagleBucks, and Dining Dollars on your One Card. EagleBucks are accepted at on-campus and off-campus locations, so there are plenty of options to choose from. You will need your One Card to check out books at Bender Library, print papers, and make copies. Be sure to keep your One Card handy when you enter your residence hall or head to Jacob's Fitness Center. 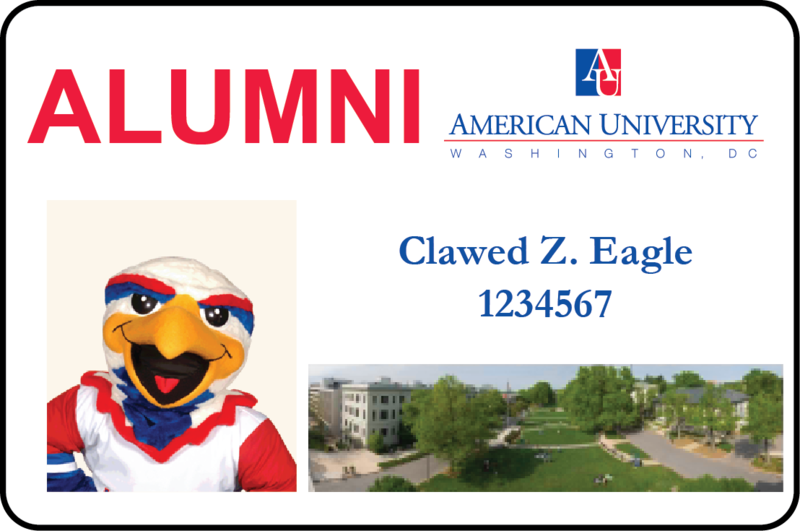 American University (AU) One Cards (University ID Card) may only be issued in person for individuals other than online students or alumni. Only one (1) One Card can be issued at one time. Individuals who have dual designations, i.e. staff and student will be issued a One Card based on their primary status or University designation. By taking or submitting a photo for your University ID Card, you hereby give permission to American University ("University") to use your name and image, visual likeness, portrait, or photograph taken of you during your affiliation with American University, without compensation, in all forms and media (including but not limited to publications, websites, catalogues, brochures, books, magazines, photo exhibits, motion picture films, and/or video) for any promotional, marketing, or any other purpose which the University deems fit in the interest of education, knowledge, research, marketing, advertising, or public relations. Fri: 11:30 a.m. - 5 p.m.
Visit the Eaglebucks page to see up to date information on our Off-Campus Eaglebucks merchants and promotions. New students may submit their photo online before arriving on campus or have their photo taken in the One Card & Dining Services office. Students are strongly encouraged to submit their photo online, ahead of respective deadlines, to avoid the long lines associated with move-in. If your photo is not approved you will receive a notification to resubmit, or you may come into the One Card & Dining Services office to have your photo taken. Incoming undergraduates participating in Eagle Summit will also have an opportunity to have their photos taken during Eagle Summit. New staff members will receive their One Card during their New Hire Orientation. Staff may also receive a One Card before New Hire Orientation once granted a status of current staff by Human Resources. Their supervisor must request their access clearances by contacting University Police at access@american.edu. New faculty may receive a One Card once granted status as a current faculty member. New adjunct faculty members may have their photo taken by the One Card & Dining Services office during their orientation. Alumni One Cards do not include access to buildings. Alumni One Cards are free to all alumni who have completed a degree or non-degree program. Replacements for lost or stolen cards, however, follow our replacement guidelines and incur a fee of $20 to be paid by cash or credit. Alumni residing in the continental United States are eligible for an Alumni One Card to be mailed to your current mailing address free of charge. We are unable to mail internationally. All building access requests must be sent to the University Police at access@american.edu by the authorizing AU employee. All building access requests must be sent to University Police at access@american.edu by the intern or guest's supervisor. (Preferred) Pre-Production of One Cards: The department or cardholders will email photos meeting photo submission guidelines to idcards@american.edu or upload them on the myAU Portal. Card Production in the One Card & Dining Services office: An in-office appointment for fewer than 30 people at once. You must submit the cardholders' legal names, AU ID numbers, and date of card expiration. All American University students, staff, and faculty may upload a photo on the One Card Photo Submission page on their myAU Portal. Please upload your photo on your myAU Portal. Online photo submissions will continue to be received on a rolling basis after peak periods following the above deadlines. Visit the One Card Photo Submission page on your myAU Portal. You will need to log in using your AU credentials. Alternatively, log onto your myAU Portal using your AU credentials. Navigate to Personalized Links, Life@AU, One Card Photo Submission. Click "One Card Photo Submission." Follow the instructions to upload your photo. Submit by July 31 (Fall Semester) and December 11 (Spring Semester) to avoid the lines during move-in and Welcome Week! If you receive errors uploading your photo, contact the IT Help Desk for 24/7 support at 202-885-2550. Incoming students should prepare to submit a photo to avoid long lines and wait times during University opening in August. The deadline for online photo submissions for fall semester is July 31. The deadline for online photo submissions for spring semester is December 11. New residential students can take a photo during Eagle Summit if unable to upload a photo. Your One Card will be available at your residence hall front desk when you move in during Welcome Week. Graduate, Law School, and online students are encouraged to upload a One Card photo. One Cards may be distributed by your Academic Advisors during orientation sessions or picked up at the One Card office. Please note that the One Card Office will be in peak operation during preparation for the academic year (May-August) and at the start of the academic year (August-September). You should anticipate at minimum 4-5 business days for processing of a new One Card photo submission, and more during peak operation periods.